gender equality | Listen Girlfriends! I am writing as a blogger and graduate student at UNC-Chapel Hill to express my concern about UNC’s current unwillingness to join with other private and public universities to support tougher safety standards for the purchase of UNC branded clothing. I fear that failure to do so will only rebound to negatively affect our own image into the future. I urge you to require all university licensees to sign the Bangladesh Safety Accord. The universities that have signed the Accord have included prominent private institutions such as Duke, University of Pennsylvania and Cornell, and large state schools similar in size and reputation to UNC-Chapel Hill, such as Michigan, Penn-State, University of Wisconsin-Madison, and University of Washington-Seattle. It has been exciting to witness such a diverse range of institutions that have demonstrated an investment in valuing workers’ voices and lives. It has thus been disappointing and frustrating that neither of you, President Ross and Chancellor Folt, has made any kind of similar commitment on this issue. Since the fall, the UNC End Deathtraps coalition has been campaigning persistently to get Chancellor Folt to sign the Accord. Workers, students, community members, the Chapel Hill Town Council, and the University’s Licensing Labor Code advisory Committee (LLCAC) – a committee composed of faculty, students and administrators – have strongly recommended that the Accord is the best option for both workers and UNC. Despite this adoption of best practices elsewhere, President Ross, your recent memo, delivered the night before the one year anniversary of Rana, states that licensees producing and sourcing goods from Bangladesh should be given the option to sign on to either the Bangladesh Accord or the Alliance for Worker Safety. But the Alliance is a company-controlled, non-binding agreement that has been critiqued for its exclusion of workers and their representatives and for its failure to obligate brands to pay for factory safety renovations. If licensees choose to sign the Alliance, then they would not be required to make any tangible changes in garment and apparel factory workplace safety. Instead, they would be resorting to the same self-regulatory approaches that have tragically failed workers far too often. They would be, in essence, doing what they have already done. Allowing brands to continue to supply to UNC whether or not they sign the Accord would allow current suppliers like North Carolina based VF Corp., owner of North Face, Jansport, Vans, and Timberland, to continue to escape accountability for their workers’ safety. VF Corporation has an alarmingly sizeable presence in Bangladesh, sourcing from 91 factories and employing 190,000 workers. Despite its many safety violations that have demonstrated deep negligence and disregard for human rights and safety, including a 2010 factory fire that killed twenty-nine workers in a VF supplier factory, VF is refusing to sign the Accord. UNC’s failure to insist that all licensees sign the Accord only allows VF’s blatant disregard for worker safety to go unchecked. This not only threatens workers’ lives but also negatively impacts UNC’s image. 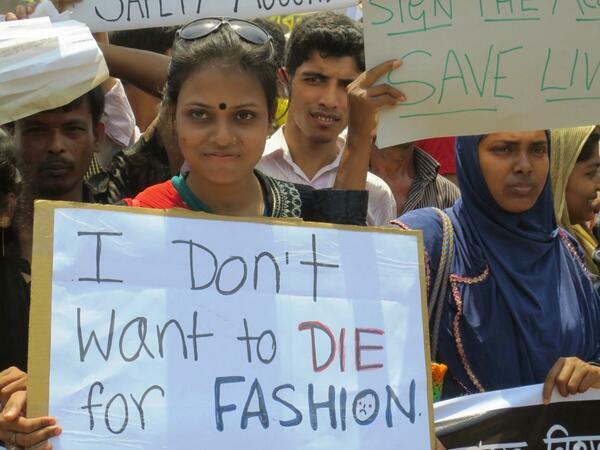 Do you really want to imagine a situation in which a woman’s body is hauled out of an unsafe factory clutching a garment made by VF Corporation, a company with which UNC has a sizeable contract? I know that you are both people who are regarded as having high ethical standards, and I’m sure you would not want this on your conscience. Given that most of the other major licensees with collegiate production in Bangladesh have signed the Accord, including Adidas, Knight’s Apparel, Fruit of the Loom, and Top of the World, this recent decision made by Tom Ross and supported by you, Chancellor Folt, to give brands the option to ‘choose’ between the Alliance or the Accord seems to stem from a reluctance to terminate VF corporation’s contract if it does not join the Accord. What is UNC’s interest in protecting VF’s Bangladesh operations? On the contrary could you not make an argument that the more UNC supports the Accord, the greater is the chance that jobs might come home to North Carolina’s textile factories that were priced out of the global market by our collective indifference to the conditions that foreign workers slaved in overseas? It is embarrassing that UNC’s leadership has chosen to keep a contract with a corporation that has not only killed 29 people in Bangladesh, but has worsened conditions in the state by abandoning its local workers. And it is beyond disappointing that you both have chosen to side with a corporation over the needs and requests of its workers, your students, and the community in which you both live. President Ross and Chancellor Folt, I urge you to reaffirm your commitment to the highest ethical standards and to demonstrate that our university will never sanction behavior that treats workers as though they were disposable. We are all citizens of the same global community, and this is a pressing human rights issue. As leaders of a major university with a prestigious reputation, you could really make a difference both in Bangladesh and by setting an example for your students. It’s time to do the right thing and require all university licensees to sign the Accord. That is the Carolina Way. At the one year anniversary of Rana (photo courtesy of Solidarity Center). Are you a UNC student/alum/supporter? Want to let President Ross and Chancellor Folt know that you want them to support the Accord?